In a deep saucepan just large enough to hold the tomatoes, cook the onion in the butter until soft. Finely grind 1/2 cup of walnuts with 3 garlic cloves. Add to the cooked onions. Stir in the coriander seed (grinded), marigold, 1/2 teaspoon of salt, 1/4 teaspoon of pepper, paprika and cayenne. Pour in the boiling water and the vinegar. Pour in the boiling water and the vinegar and simmer for 10 minutes. Meanwhile, slice the tops off the tomatoes and scrape out the seeds, being careful not to puncture the skin. Grind together the remaining 1/2 cup of walnuts, garlic, clove, salt and black pepper. Stir in the finely chopped herbs. Stuff the tomatoes with this mixture and replace the tops. Place tomatoes in the nut sauce and cook them over low heat, covered, until they are tender but still hold their shape, about 25 minutes. Allow cooling to room temperature in the pan. 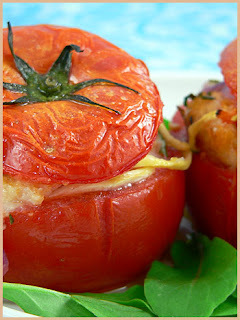 Serve tomatoes on a bed of the sauce, garnished with sprigs of cilantro.